This agreement should be used for a series of events where financial support is given by the sponsor in return for advertising or other rights. The events themselves could be diverse, from sports competitions (such as a football league, bowls tournament or weightlifting championship) to shows with varying content(such as an outdoor cinema festival showing a series of specialist films over a number of days), in different locations (such as a travelling theatre production), or differentiated by timing(such as an outdoor equipment exhibition that takes place over the first weekend of every month in summer). The sponsor may receive additional rights, such as the right to sell products from a stand or the right to advertise their status as an event sponsor of the on marketing material. This contract is very flexible in the terms to be agreed between the parties. We suggest common rights to be granted to the sponsor, such as advertising, product placement, preferential event access, hosting of corporate hospitality functions and promotion in the media. These suggestions can be replaced or supplemented by those rights that you decide upon. This agreement is particularly important for setting out the precise requirements of the sponsor if they have not worked with the event organiser before. The charismatic organiser may be highly skilled at pulling together the event (for example by financing it through sponsorship) but may not be the person managing the employees on-site. It includes a number of legal matters to the advantage of both sides that might be left out of less comprehensive agreements, such as protection of intellectual property, prohibition of transfer of rights, and rights to renew sponsorship. This document could be used by the event organiser or the sponsor, probably at first to explore the deal that could be made, and then as the legal contract. Either party could initiate drafting and send it to the other as their preferred terms on which to start negotiations. The sponsor could receive any number of rights, but these are likely to include advertising or branding of some sort. We also have another agreement that may be more suitable if the sponsor is sponsoring a single event (for example, a home and garden exhibition, or a single sports match). 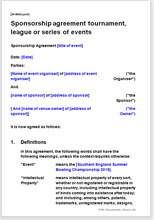 See Event sponsorship agreement.